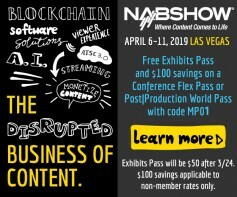 In a Broadcast Engineering and Information Technology Conference (BEIT) session entitled “Components of Cloud-Based Broadcasting, from Content Creation to Delivery,” to be held on Sunday April 7 at 10:40 AM - 12:00 PM in room N260 (during the 2019 NAB Show in Las Vegas) Dominic Giambo, Senior Development Engineer at audio production equipment provider Wheatstone, will lead a discussion on the applications, components and technologies that make up a reliable and secure cloud environment. Topics to be covered will include private and public Cloud Service Providers (CSP), the how and why of SIP connectivity, and latency, codecs and security issues. The heretofore on-premise creation, editing and audio mixing of programming that now uses cloud-based applications is also a key part of the discussion, as will decentralizing operations and program distribution using IP connectivity as an alternative to C-Band satellite services. Products like the Wheatstone LX24-16 console can access cloud-hosted services to create, edit and mixing audio programming quickly and efficiently. The session will also look at acceptable thresholds for network latency and jitter, based on recent lab experiments and new findings on codecs and other components of the cloud based operation conducted by Wheatstone engineers at its New Bern, North Carolina headquarters and others. At the NAB Show Wheatstone will demonstrate its WheatNet-IP is a network system that utilizes Internet Protocol to enable audio to be intelligently distributed to devices across scaleable networks. All audio sources are available to all devices (such as mixing consoles, control surfaces, software controllers, automation devices, etc.) and can be controlled from any and all devices. WheatNet-IP is AES67 compatible, and represents an entire end-to-end solution, complete with audio transport, full control, and a toolset to enable exceptionally intelligent deployment and operation. If your organization is considering virtualization and moving on-premise operations to the cloud, especially in terms of audio production and content distribution, this is a must attend event. “Distributed Cloud Technology for Broadcast Systems”, to be held Sunday, April 7 at in Room N260 – D and presented by Tony Jones, Principal Technologist at MediaKind; and “Intelligent Cloud-Based Standards Conversion”, to be held Sunday April 7 in room N260-E and led by Paola Hobson, Managing Director at InSync Technology. Free exhibit hall pass. Register via this link.